The East Pittsburgh police officer who fatally shot Antwon Rose, Jr., three times last week was charged Wednesday with criminal homicide. Rose was the passenger of a car suspected by police to be involved with a drive-by shooting in North Braddock minutes before his death. Allegheny County district attorney Stephen Zappala told reporters today that the evidence did not indicate that Rose was the shooter in that incident. When that vehicle was stopped by officer Michael Rosfeld about 13 minutes later, Rose fled from the traffic stop. Rosfeld responded by opening fire on the teen, hitting him in his face, right elbow and back. Rose, who is black, was unarmed at the time of the police shooting. Allegheny County DA has charged officer in Antwon Rose shooting with criminal homicide. Allegheny County police arrested and charged Rosfeld, 30, who is white, today in the June 19 fatal shooting of Rose, according to court documents. The teen “bolted” from a traffic stop after the vehicle he was riding in was suspected of being involved with a shooting in North Braddock that occurred 13 minutes earlier, Allegheny County Police Superintendent Coleman McDonough told reporters last week. 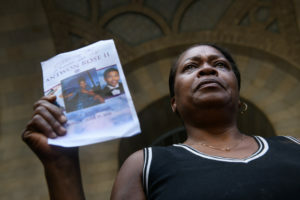 READ MORE: What we know about the police shooting death of Antwon Rose Jr.
Police later said two semi-automatic weapons were recovered from the vehicle Rose was in and that an empty gun clip was found on his person. Two other occupants, the driver and another passenger, were also in the car. Soon after the shooting, the 20-year-old driver was questioned and released by authorities. The other passenger was a juvenile and police are expected to file charges against him for the North Braddock shooting that happened minutes before the fatal shooting of Rose. On Wednesday, Zappala identified the suspected gunman in the North Braddock incident as Zaiwan Hester, adding that Rose was not the shooter in that earlier incident. “Antwon Rose didn’t do anything in North Braddock other than being in that vehicle,” Zappala told reporters. Tests are pending on gun residue on Rose, but “clearly Hester is the shooter,” he said. According to two witnesses in close proximity to the fatal shooting of Rose, the teen showed his hands, turns and runs. He was not in possession of a weapon, Zappala reiterated. The district attorney also said Rose did not fire a gun at all that evening. There was no weapon that created a risk to Rosfeld, Zappala said. The evidence shows that Rosfeld fired his gun three times at a fleeing Rose, striking him in the side of the face, in his cheek; in his right elbow from the rear; and one in the back with the bullet lodging in his chest. Rosfeld was sworn in hours before the shooting, but police also said he had been working at the police department for up to three weeks. Rosfeld has also worked at other police departments in the area for seven years. When McDonough was initially asked about the officer’s race last week, he declined to confirm the information. “I don’t understand what that has to do with the situation,” McDonough told reporters. Rosfeld has been on administrative leave since the shooting. His bail was set for $250,000. Court documents show that Rosfeld did not request a public defender. Rosfeld’s attorney Pat Thomassey told WXPI that the officer turned himself in Wednesday and has been arraigned. Thomassey told a local television station that he didn’t see it as a murder case. A preliminary hearing for Rosfeld has been scheduled for July 6.